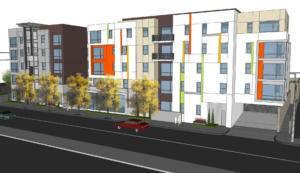 Affordable housing project bolsters the general contracting firm’s multifamily portfolio. Irvine, Calif.– R.D. Olson Construction, an award-winning general contracting firm in California, has commenced work on a 55-unit affordable housing project in Fullerton, the company announced today. The multifamily apartment complex is the firm’s fourth affordable housing project, and completion is expected in May 2018. Fifty-four of the units will be affordable, with one manager’s unit on-site. The five-story, 52,407-square-foot complex will be comprised of studio, one-, two- and three-bedroom apartments in two buildings that are connected by a bridge on all floors. There also will be a 24,000-square-foot parking garage on the one-acre site, which is located at 335 East Santa Fe Avenue, in close proximity to Downtown Fullerton and adjacent to the area’s train station. Amenities will include a courtyard, playground, BBQ area, on-site leasing office, laundry facilities and bike storage room. Related California is the developer for the project, with IDS Group serving as the architectural firm. The R.D. Olson Construction project team includes Gary Hoskins, project manager; Jeff Stratton, project superintendent and Mat Epperson, project engineer. The firm’s other multifamily projects in the area include 27 Seventy Five Apartments in Costa Mesa, Coronado at Newport North in Newport Beach, Marriott Newport Coast Villas Newport Beach and Sea Villas at the St. Regis in Dana Point. The Village at Calabasas, which completed in 2016, marked R.D. Olson Construction’s last affordable housing project.